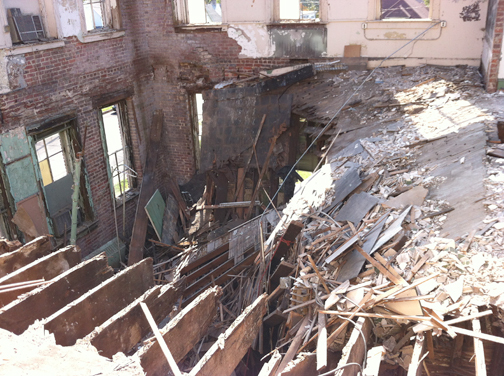 A few years ago, the old Oakwood Elementary School was headed for demolition, assuming the dilapidated building didn’t collapse on its own first. Built in 1914, the former school was a dark hole in the Oakwood neighborhood, a modest community a few blocks north of downtown Knoxville and east of Interstate 275. The roof had caved in. Vandals had taken over the classrooms. As the abandon school deteriorated over the 23 years it had been vacant, so had the housing stock on surrounding streets. It seemed there were more boarded up windows than residents in the neighborhood. Knox County government had no luck in finding a developer willing to do anything feasible with the building. 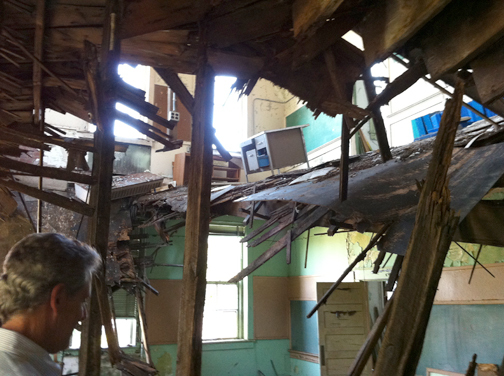 The wrecking ball was looming, but preservation advocate Kim Trent had other ideas. She knew a guy who could save the former school building. Trent, executive director of Knox Heritage, a historic preservation organization, picked up the phone and called Knoxville developer Rick Dover. 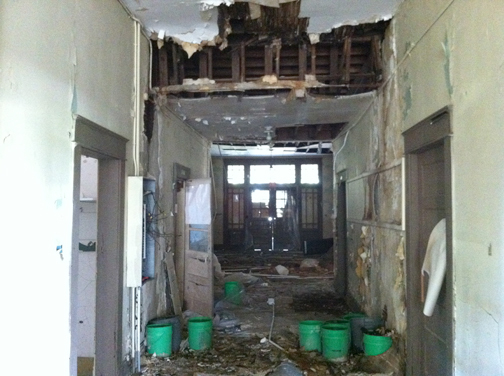 Dover was not put off by the blown out windows, extensive rain damage, collapsed roof and general disrepair. He saw potential. Dover said it was clear to him that despite its condition the 55,000 square-foot former school could be turned into an assisted living center for seniors. He immediately started his company working on a bid proposal. “She just basically got me to go see the building as only Kim can do, but as soon as I pulled up I knew it would work,” Dover adds. As it turned out, Dover Development was the only company to submit a bid for the property. Eventually the Knox County Commission, with Mayor Tim Burchett’s support, approved a package of tax breaks worth about $712,000 that made the financing of the redevelopment project work. Dover Development invested about $8 million and agreed to retain and restore as much of the building’s original architecture as possible. Like many of the other historic buildings Dover’s company has restored and turned into senior housing, Oakwood has a wide central hallway and former classrooms that are the perfect size for senior apartments. The building also had the original kitchen and cafeteria and could easily be modernized to meet the needs of an assisted living center. The former gym was turned into a spacious lobby with 20 foot ceilings. 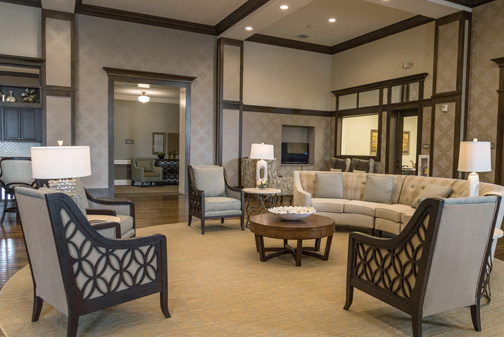 It took two years and the unraveling of considerable bureaucratic red tape to overcome conflicting state and local requirements, but Oakwood Senior Living Center finally opened late last year. More than half of its 62 apartments are already occupied. Many of the residents had once lived in the neighborhood, and several had been teachers at the former school. Preserving historic architectural features is only part of what Dover Development does when it turns an old building into senior housing. Critical to its financial plan is Dover Development serving as its own general contractor to reduce costs. Dover also keeps a close eye on operating costs which helps keep the centers affordable for residents. “Realistically you gotta make the thing pay its bills or your first one (senior housing development) will be your last one so we keep an eye on that. But, also, I’m mindful of ultimately we’ve got to be able produce a great product – visually compelling but more importantly the care aspect, Dover explains. Quality care is the most important factor in marketing the centers to potential residents, he adds. Dover managed his company’s senior housing developments himself for 15 years. It was exhausting, but a few years ago a friend threw him a lifeline by introducing him to Chris Sides, president of Senior Solutions Management Group. The Georgia-based company manages senior housing centers in 17 states. Dover admits to being “a control freak” and his business relationship with Senior Solutions started slowly. Sides said the Dover has a unique knack for building quality senior housing that is affordable. “It takes a certain skill set. Many people who have tried to do it have not been successful,” Sides says.